Who doesn't love the idea of having bright pink waffles for lunch? Well I do. For the past few years I've been experimenting with chickpea flour pancakes. They're pretty simple to make, require only a few ingredients and can easily be switched up by trying new spices and toppings. 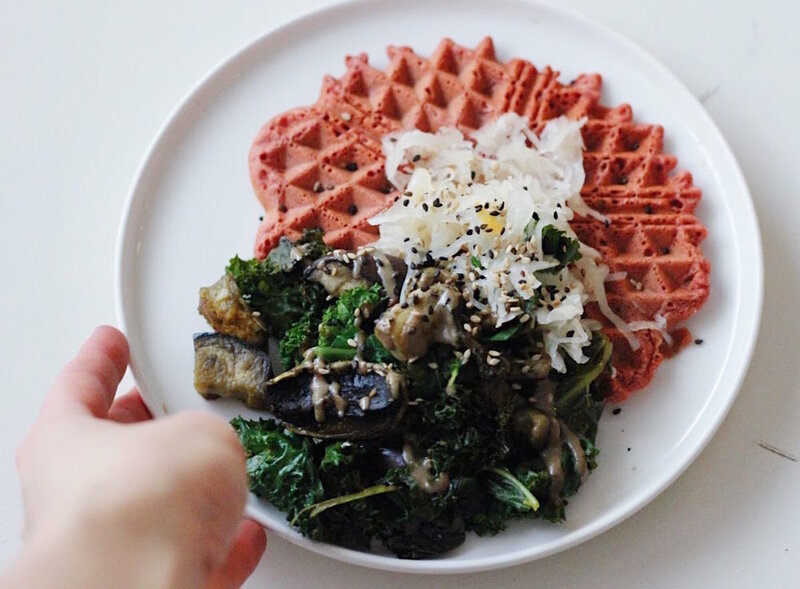 When my friend was out exploring the islands of Bali, I got to borrow her waffle iron and so these beetroot waffles were discovered. I used my regular savoury pancake mix but switched the pan into an iron. Let’s start with roasting the eggplant. Heat your oven to about 200C (or 175C with fan). Cut the eggplant into discs of about 1-2cm. Sprinkle with salt and let the eggplant ‘‘sweat’’ for about 10 min before rinsing the salt off. This will help with getting a nice soft texture when roasting the eggplant in the oven. Cut the discs into chunks and top with some olive oil, salt and pepper. Roast the eggplant for about 15 min. While the eggplant is roasting we can mix our dough by starting with the dry ingredients. Mix the cumin and salt into the flour. In a separate bowl whisk together the water and beetroot juice before mixing the liquids in with the flour to create a pancake mix like dough. Let the dough rest for 5 min before baking. While the dough is resting let’s prep the toppings. Grab your frying pan and add a few table spoons of water. We’ll start with steaming the kale. Once the kale is steamed we’ll add in the garli, oven roasted eggplant and mushrooms. Spice up with salt and pepper. Bake your waffles in some good quality olive oil. Serve hot topped with the warm veggie salad, tahini and sauerkraut. Garnish with some sesame seeds.